Sauté onion in olive oil with red pepper flakes, add chopped tomatoes and cook over medium heat about 30 minutes. Cool slightly. Divide into 2 equal portions. To assemble, you will need a pinch of coarse sea salt, butter, parchment paper, aluminum foil, and a 12” springform pan. Preheat oven to 350°F. 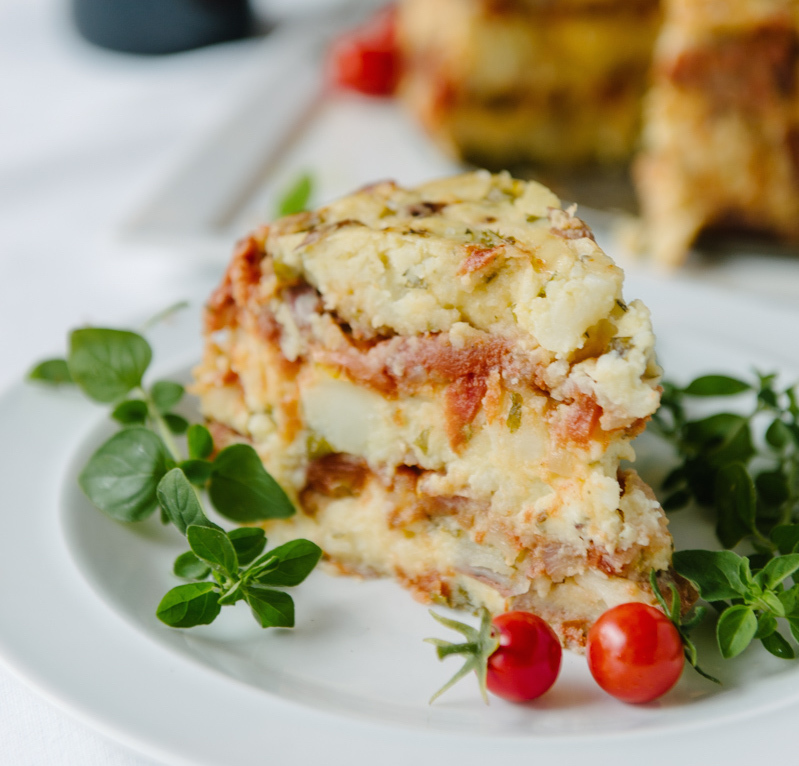 Stir together mashed potatoes, eggs, cheeses, fresh herbs and divide into 3 equal portions. Butter the springform pan and add a ring of parchment paper to inside wall of pan to make a parchment riser about twice the height of the original pan. Cover bottom with 1/3 of potato mix. Add half the tomato layer, then another potato/cheese layer, then tomato, then potato/cheese. Brush the top with olive oil and fold extra parchment around the edges over the top of the cake. Bake the cake for about an hour, then cover with foil and bake another 20 minutes. Remove foil, cool cake, and let it sit for at least 20 minutes to set. Transfer cake in the pan to a serving platter, remove springform and peel away parchment. Drizzle with a bit more olive oil and sprinkle with sea salt to serve.